The mission of the Bennington Museum is to celebrate the history and heritage of the southern Vermont region, as well as serve as a venue for visual and performing arts that enrich our community and our world. Incorporated in 1852 as the Bennington Historical Association, the Bennington Museum is one of only a few accredited museums in the state of Vermont. The Association was founded to commemorate the pivotal 1777 Revolutionary War battle fought near the town. Following the dedication of the 306-foot-tall Bennington Battle Monument in 1891, the Association turned its attention to a more comprehensive preservation of history, art and material culture in southern Vermont and nearby areas. After years of searching for a permanent home, the Association in 1923 acquired the beautiful, native stone structure that had served as the first St Francis De Sales Catholic Church from 1855 to 1892. Following some functional renovations, the museum opened to the public in 1928 as the Bennington Historical Museum. Expansions took place in 1938, 1960, 1974, and 1999. The Museum's name underwent changes as well, becoming the Bennington Historical Museum and Art Gallery in 1938, and then simply the Bennington Museum in 1954. As the largest art and heritage repository in southern Vermont, the museum houses diverse collections reflecting the history of early Vermont and historically associated areas of New York and Massachusetts. Art and artifacts range in date from the early 18th century to the present. Items include the largest public collection of paintings by the great American folk artist Grandma Moses, which draws visitors from around the world. Also on permanent exhibit is Vermont-made furniture, Ralph Earl's painting of Bennington in 1798, a 1924 Martin Wasp touring car, one of 20 made in Vermont by Carl Martin, and Bennington pottery featuring Norton pottery, Fenton pottery and Redware. The Flag Gallery features one of the oldest "stars and stripes" in existence - the Bennington Flag. The museum also maintains a Research Library with a substantial nucleus of New England historical and genealogical materials, including over 8,000 books, documents and primary sources. The museum focuses on serving local and regional communities. 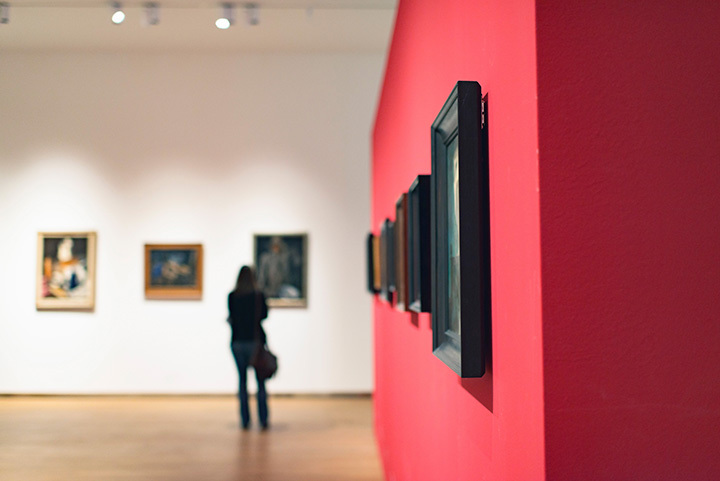 In addition to its permanent exhibits, numerous temporary exhibits and public programs bring to the region a broad spectrum of cultural expression in the visual and performing arts. Temporary exhibits have ranged from photography by such prominent photographers as Friedlander, Stieglitz and Adams, to works by regional artists including sculpture, oil paintings and more. Concerts, Workshops, Antique Appraisals by guest appraisers, and engaging historical presentations by local and nationally acclaimed authors and historians, round out Bennington Museum's offerings. The property is further complimented by the Hadwen Woods and the George Aiken Wildflower Trail. This area is being developed to present the native species of wildflowers found in George Aiken's book entitled "Pioneering with Wildflowers" This area is open to the public.